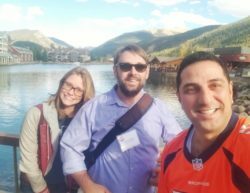 Keystone, CO – Wadi Muhaisen presented a continuing legal education course, “Winning at Jury Selection: Voir Dire Basics and Practical, Jury-Focused Strategies,” at the Respondent Parent’s Counsel Conference on September 22, 2018. The theme of the conference was “OBJECT! Shaping Your Case Through Tailored Advocacy. Andrew Schoedel and Jessica Beaulieu, M2 attorneys who defend parents’ rights in Dependency and Neglect cases also attended the three day conference. (L to R) Jessica Beaulieu, Esq., Andrew Schoedel, Esq., and Wadi Muhaisen.